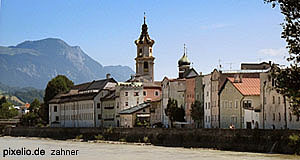 The small town of Rattenberg with its mere 463 residents (in words: fourhundredandsixtythree) is part of the diocese of Salzburg, but solidly set on Tyrolian soil. Small not only in terms of the population, Rattenberg is also the smallest community of Tyrol in terms of land. The claim to be a town rather than a village thus comes from the longstanding history that gave some significant privileges to Rattenberg and granted the higher rank. It was founded as a mining town similar to Schwaz, yet much smaller as a settlement. Since it was located by the River Inn, it made a good spot to secure the trade that followed the course of the river and made more money on taxation than on mining ever since the 10th century, when the first castle was constructed. Similar to nearby Kufstein and Kitzbühel, Rattenberg was part of Bavaria during the Middle Ages and became part of the Habsburg′s empire only in 1504 under the rule of Emperor Maximilian I. Today, the tiny town is known for its traditional glass manufacturing and general appeal. Of particular interest are the houses along the river Inn as well as those embracing the main square. Stop by at the parish church St. Virgil (remember that it is part of the diocese of Salzburg: Virgil was an early bishop there) and admire its 15th century architecture, the mighty altar built by Meinrad Guggenbichler (the same man who is responsible for the interiors of the monastic church of Mondsee in Upper Austria) as well as the shrine of St Notburga, a local saint born in Rattenberg. Another attraction is the former Augustine abbey that is now a museum featuring a collection of regional artwork with a focus on Gothic artefacts. Nearby Rattenberg you will find access to the Alpbach valley that will lead you to the village of the same name. Alpbach can be traced back to 1240, but for most of its time it was nothing but a very pretty Tyrolian village. This was to change in 1945, when Simon Moser and Otto Molden founded the "Alpbacher Hochschulwochen", a symposium transformed into the "European Forum Alpbach" in 1955. Nobel Laureate and Tyrol-aficionado Erwin Schrödinger was an Alpbach regular, he helped to make the annual symposium an event of worldwide fame. For several weeks every year in August, dozens of leaders from academia, business, media and politics meet to discuss serious matters of usually European dimension. Erwin Schrödinger himself wanted to be buried in Alpbach - you can see his grave on the local parish church′s cemetery. The village is a wonderful place for relaxing hikes on one of the Alps′ most beautiful sceneries, but make sure to go there at a different time than the forum - rooms fill quickly during that time. Alpbach is also famous for flower decorations that many villagers put on their houses during the summer - this might be a bit of a hype, though, since decorations of that kind are common all over Austria.